Whether you use your basement as an extra bedroom, an entertainment space or simply for storage, you would be wise to take precautions to guard against water damage. Basements are especially vulnerable to flooding and leaks and the growth of mold that often follows these events, yet many homeowners unwisely install wall-to-wall carpet when they remodel. Over a concrete basement floor, ceramic tile can be a much better option for homeowners who may have to deal with flooding or leaks from time to time. Tile doesn’t have the same vulnerabilities to moisture as carpeting. Unfortunately, while ceramic tile is a better overall option than carpet, there are some potential problems that could force you to call a tile repair company if you do not plan carefully. Concrete and tile are great together — they stick well, but sometimes maybe too well. Over time, concrete, especially new slabs, will start to crack. When concrete cracks occur, it puts a lot of tension on tile at the surface. Since tiles are 1/10 as strong as the concrete beneath, they will eventually crack and split in some spots. The best way to effectively combat this issue is to have a basement finishing contractor install fibers and steel at the beginning of any remodeling project. 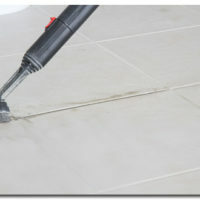 This will help give the concrete more strength to combat tension, reducing the severity of cracks. 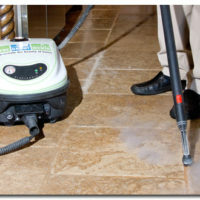 Your tile will have less chance of cracking but will still provide great protection against water damage. If that solution sounds like too much for your remodeling project, you should at least set aside some extra tiles during installation. With leftover materials, a tile repair contractor can easily come in and fix cracked tiles with a perfect match to the existing flooring. Ceramic tile can be the perfect option for a basement with cement flooring, but it takes smart planning and quick repairs to maintain optimal protection. Contact the Grout Medic for all of your grout and tile cleaning and repair needs in the basement and throughout the whole home!